Most people plan their finances to account for the everyday. The every day expenses, financial obligations and pleasures. A far fewer number of people think about the future. Their future selves, future responsibilities, successes and struggles. There future selves are a distant stranger. 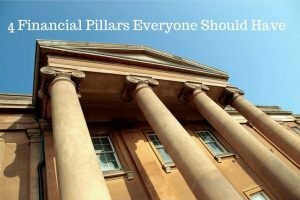 Like the 4 walls that hold a building in place, these 4 financial pillars are essential to overcoming and enduring life’s unexpected and many times unwelcomed surprises. It is not the every day that catches us off guard, but the sudden shifts and the slow creeping up of time that gets us. Once you have a handle on how to budget effectively and you know where your money is going, it is important to put these four financial walls in place. Think of the pillars as guide posts. There is much debate about whether someone needs an emergency savings fund or not and I would say the personal finance community is torn with this question. My response to it is this. Unless you can predict the future, then you need an emergency fund. Low interest rate credit such as a mortgage is no substitute to cash, your cash, ready, when you need it with no strings attached. This is key. To financially thrive long term, it is important to break away from the shackles of debt and be your own creditor. The people that win in a financial transaction are those that receive the interest payments, not give them. The most important benefit of an emergency fund is getting away from owing someone money for something that is no longer bringing you any economic value (a debt with economic value would be a mortgage or business loan). So how much is needed to fund an emergency fund? Well that depends on your life expenses in these four major areas: housing, transportation, food and utilities. Determine how much you spend per month in these four areas and multiply this number by six. This value should give you your ideal ‘fully funded emergency fund.’ If that number seems a bit scary, start with $1,000 and work your way to $5,000 then add a little more as time goes by. Even with $5,000 allocated to emergencies, you would be better off than most. Here is a stat to put things into perspective. 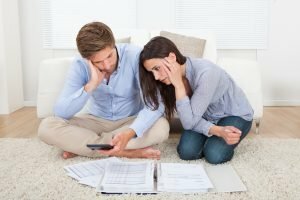 52% of Americans could not cover an unforeseen expense without borrowing the money or selling something. Don’t forget an emergency fund is designated for unexpected expenses. As much as you may like it too, the mini vacation, clothing or shoes you must have does not fall under the category of unexpected. If you could have predicted the expense in the recent or distant future, then it is not unexpected. Next on the financial pillars is saving for retirement is probably notoriously forgotten because it seems so far away and there always seems to be more time to save for retirement. However, one thing is for certain, if we are still alive, then we always aging and getting older and there will come a time when we cannot or do not want to work. To be able to withdraw $5,000/month for 30 years you will need to have just over a million dollars in investments that are providing a 6% rate of return at 2% inflation. The best time to start saving for retirement (if you haven’t already) is now. It doesn’t matter if you’re are 20, 30, 40 or 50 years old. You can’t undue the past, but you can make a better future for yourself. 36% of Americans are not even saving for retirement and the one’s that are, only 67% are taking full advantage of their employer’s 401k matching contributions. So how much do you need to save each month to get the retirement your want? That depends on a lot of factors, including: when you start to save, what your risk tolerance is and ultimately what you are invested in, inflation, how you want to spend your retirement. A few guidelines might be to save at least 15% of your income, always take advantage of retirement matching programs with your employer and don’t forget to save money from all sources of income, including bonuses, tax refunds, pay increase etc. Nobody ever sees the value of insurance premiums until they need to make a claim. We have all probably experienced it with our vehicles. Whether the accident was our fault or not. The cost of getting a car rental and fixing the wrecked car can really add up. We appreciate it when the mechanic rings up the total and tells us that our insurance will be covering the bill. We all understand the benefit of car insurance, and we see that benefit much sooner. Also don’t forget about finding the right health insurance. The same is true for life insurance, except the benefit is not for us, but the one’s we leave behind. Term life insurance is more than adequate for most Americans and fairly inexpensive. The benefit far outweighs the costs and at the very least, it is worth considering. If you have dependents that rely on your income for their survival and/or you have debts, then having insurance is a must. Last but not least on the pillars is a about creating a will. A will is a directive of how you want your assets to be distributed when you die. Many people who opt not to create a will feel that they don’t have enough assets or wealth to justify drawing up a will. However, many times we underestimate the value of our assets because we forget to account for things like company pensions, life insurance policy through work etc. Other benefits to having a will include: choosing who you would like to benefit from your estate (instead of having the state decide), protecting the interest of minor beneficiaries, nominating guardians for your minor beneficiaries and choosing the executor or trustee of your choice. Without a will, you are subject to the states procedure for distributing your wealth. This may not always be in your best interest. Protect yourself and your family by drawing up a will. These 4 financial pillars create the structure that holds everything else together. Without these in place, even the best budget can unravel in a moment.